Swaggering up to a Tenderloin corner where, by contrast, area denizens typically stagger and stumble, Black Cat (Eddy and Leavenworth), a new restaurant arrival, is an already lively — if unexpected — destination. Announced in the spring and opened five weeks ago, the space has two floors and several components to understand. There's food that aims high from chef Ryan Cantwell (formerly of Zuni Cafe and Chez Panisse), cocktails — traditional and not — from Gabriel Lowe (Locanda and Beretta), and a 90-bottle wine list curated by Jardiniere somm Eugenio Jardim. While the upstairs area is first-come, first-served (and ripe for an after-work drink), the downstairs area is the heart of Black Cat — a lounge that feels like Baz Luhrmann's version of noir as designed by Craige Walters (behind bars like Blackbird and Hecho). 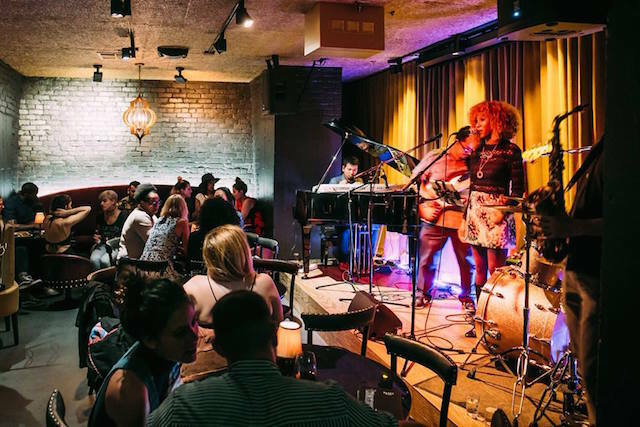 This subterranean parlor centers on a small stage where local musician Theo Croker is booking jazz and more, and it's highly recommended downstairs diners make reservations. There's a lot to take in at Black Cat —and you'll see plenty before you even arrive if you approach from the South. When I spoke on the phone to Khalid Mushasha, a Black Cat owner and the restaurant's GM, he'd just gotten off a call with the city to discuss repainting curbs to allow for cars to more easily approach via Eddy. That, he seems to think, might be a hair less sketchy than Leavenworth. Mushasha aims to consider "what's it like when guest walk in our door and what's it like before they walk in our door," which is quite the challenge in a neighborhood — and, for that matter, a city — where the faint stench of urine might lurk around any corner. Even inside Black Cat, with its many elements, Mushasha and staff seek to manage expectations. I was seated at 8:30 with two others, and a host explained that, since music would start at 9:30, we couldn't necessarily stay for the whole show that evening  again, seating downstairs is primarily by reservation. "We didn't want it to be a show parlor with seatings," Mushasha reasons, "we wanted the music and entertainment to be part of the whole experience." That means Black Cat employees tell diners roughly how much time they have to eat — about two hours for parties of three. In the end we enjoyed plenty of the night's entertainment, Jazz Mafia, a longtime Tenderloin band with a mafioso vibe. "The more information you give to customers, the easier it is for them to enjoy themselves, especially with a new restaurant," says Mushasha, who previously ran complicated operations at the Tonga Room and, after that Lolinda. "If you don't explain the experience, it makes it very difficult to enjoy." And much to enjoy there is, with shows, drinks, and company, but Black Cat is mainly a restaurant, Mushasha emphasizes. 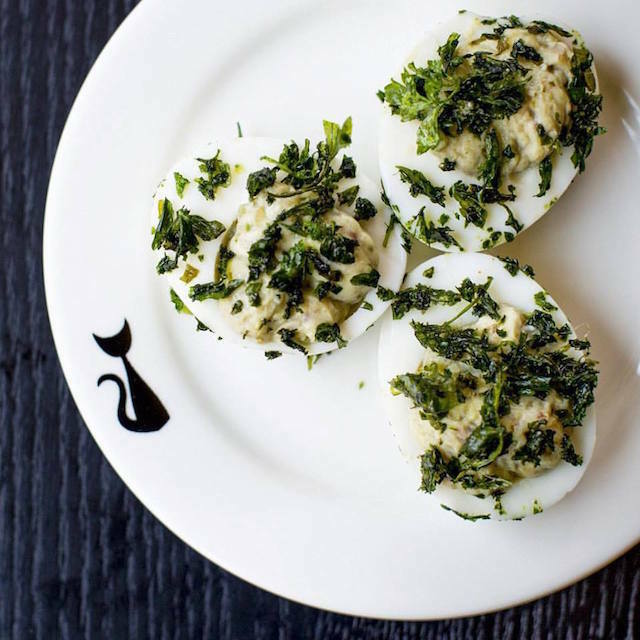 The tables may be small and the seating may be parlor-style, but the food, from bar snacks like deviled eggs to full repasts including fish meatballs, latkes, and patty melts (many dishes are of Jewish origin) provides the centerpiece. Black Cat is not a dance destination. Still, or so Mushasha hopes, Black Cat may have something for everyone. "We have three possibly four different types of clientele at any time," he guesses, counting off the happy hour crowd, the dinner crowd, the bar crowd, and, with food service 'til 1 a.m., late-night diners on the prowl.